Are you visiting CDX 2018? We are! And we hope to see you there. You can find us on stand F15 where you can have a go at our unique twist on the classic card game – “Play your CARS right”. You can also enter our prize draw, grab some freebies, see what the platform is all about and say hello to the team. CDX is at Manchester Central Convention Complex on May 21st and 22nd 2018. 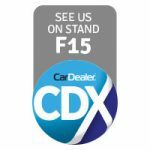 CDX is the UK’s largest automotive expo, brought to you by the publishers of Car Dealer Magazine and is free to attend for all motor trade professionals.